Strategically nestled on the Gulf of Guinea, Gabon has positioned itself as a stable and resource abundant nation that is ripe for investment. With an economy that is expected to grow by 5.6% in 2012, Gabon has joined with its African neighbors in creating one of the fastest growing regions in the world. The nation's "Emerging Gabon" initiative is seeking to further this growth through the attraction of sustainable and diversified investments, all while responsibly and transparently managing its remarkable natural resources. The nation prides itself on providing Greenfield investment opportunities and is promoting policies and best practices that create an environment where private enterprise can thrive. The nation is at the vanguard of environmental sustainability and has introduced safeguards to ensure that economic growth does not come at the expense of its natural endowments. Lush forests, elegant coastlines, humid savannas, and tremendous biodiversity are all part of the Gabonese identity and the government has used various strategies to ensure their preservation. The nation has 13 protected national parks, many of which are home to elephants, hippos and gorillas. Promotion of tourism is a cornerstone of the government's growth strategy and it hopes to attract 100,000 tourists annually by 2020. By emphasizing diversified business development and strong stewardship of natural resources, Gabon hopes to decrease its dependence on oil exportation as its primary economic driver. Its efforts to improve infrastructure and increase access to basic services has met with success, and will be key in meeting the government's goal of increasing domestic food production (it currently imports 85% of its food). 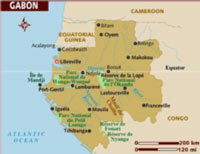 Gabon has also been recognized for its successes on the environmental front, and the country was ranked 12th in the world, and first in Africa, in Yale University's 2005 Environmental Sustainability Index. Libreville is the ocean side, French influenced Gabonese capital. With its pleasant city center and excellent restaurants it is known for its friendly people, palm-lined streets, and unique architecture. The seafront is popular with locals and many gather there to relax and enjoy views of the Atlantic Ocean. Ali Bongo Ondimba entered Gabonese politics in 1981. He served as Minister of Foreign Affairs from 1989 to 1991, before serving in the National Assembly. From 1999 to 2009, he was Minister of Defense, and in July 2009, he was selected as the official candidate for the Gabonese Democratic Party (PDG) for the presidential election that was called after the death of the head of state. Elected President of the Republic of Gabon on August 30, 2009, his official inauguration was on October 16, 2009. The government's agenda to increase investment in Gabon consists of three pillars: le Gabon Vert (Green Gabon); le Gabon Industriel (Industrial Gabon); and le Gabon des Services (Service-oriented Gabon). Green - Lead the green revolution by promoting biodiversity and ecotourism, while also reducing the nation's carbon footprint. Service - Stimulate economic development in the fields of health, media, information technology, as well as, support institutions of higher education and research within Gabon. At the Loango National Park the hippos are known to venture into the water for a swim. The park is also home to elephants, buffalos, hippos, wild hogs, gorillas and leopards. The Gabon National Museum's collection includes masks, sculptures, carvings and artwork and is also used as a venue for gallery exhibits and cultural events. This major thoroughfare is lined with major landmarks and government buildings, including the French Cultural Center, the Ministry of Mines and Petrol, the Ministry of Forestry and Environment, the Senate of Gabon, and the Central Bank. A 30 minute boat ride from Libreville, this sandy strip offers a variety of water sports and unobstructed views of the Libreville skyline.